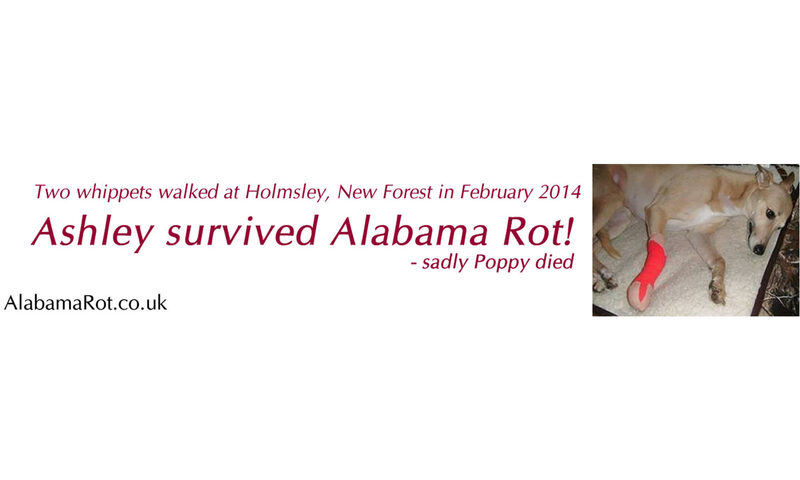 Help us stop Alabama Rot. 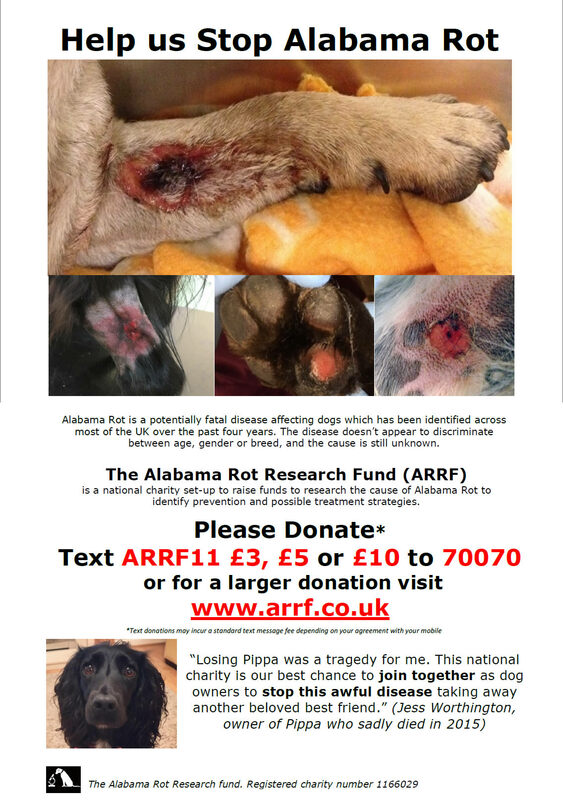 Donate to the Alabama Rot Research Fund (see below). 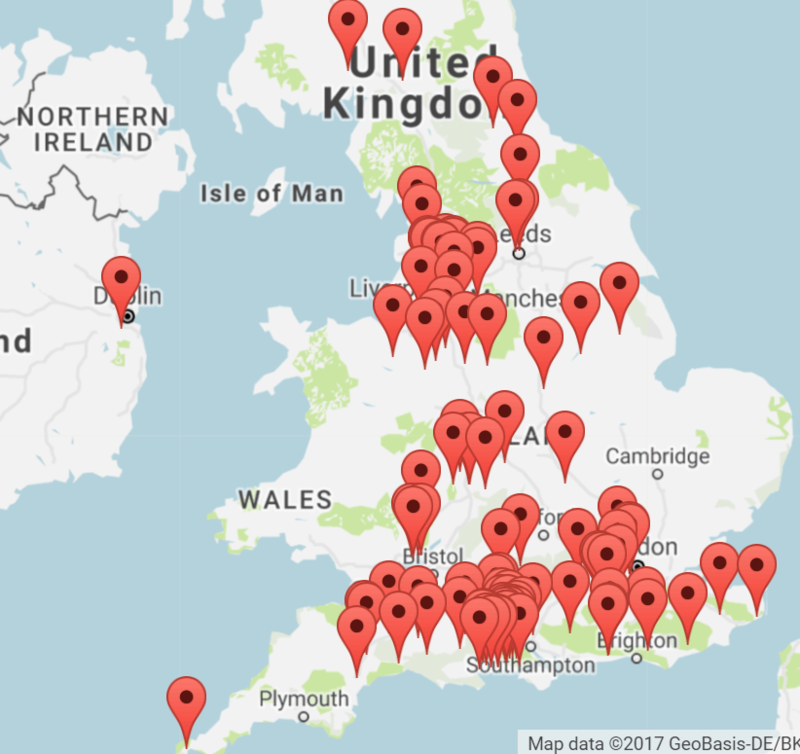 This post reports the closure of AlabamaRot.co.uk maps and donations. 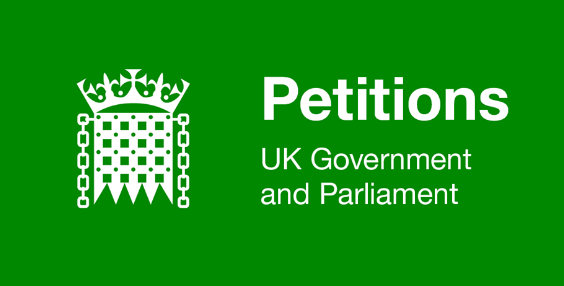 So now, Vets4Pets will host the confirmed Alabama Rot map and the Alabama Rot Research Fund will collect donations. 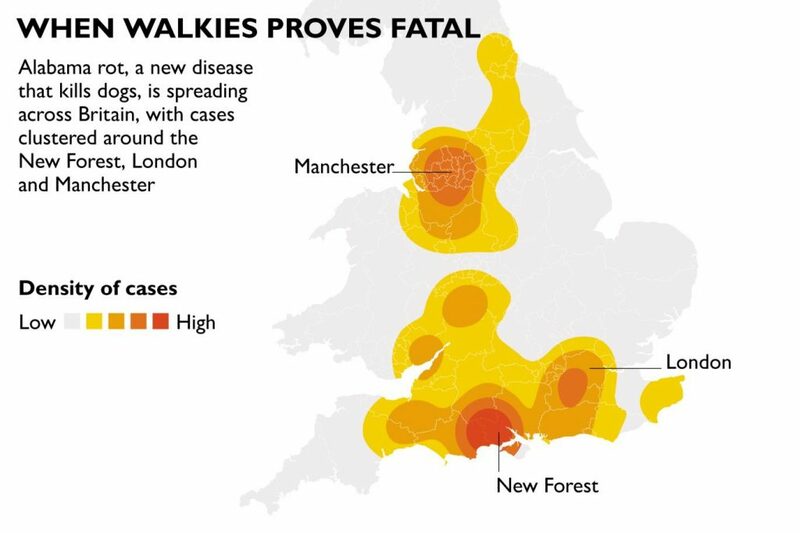 “Many of the infected dogs had been walked in muddy fields and woodlands,” said Fiona Macdonald, a New Forest vet who is investigating the outbreaks. The symptoms of Alabama rot are similar to a disease seen in US greyhounds, but there is no evidence that it has the same cause. Some vets have argued that it should be renamed New Forest disease in the UK. One theory [hypothesis] links the disease to a virus originating in the American terrapins imported as pets in the Teenage Mutant Ninja Turtle craze of the 1990s but released when they grew to the size of dinner plates. Another idea is that it is caused by bacteria found in amphibians that suffer symptoms similar to those seen in dogs. Whatever the cause, the impact can be devastating. 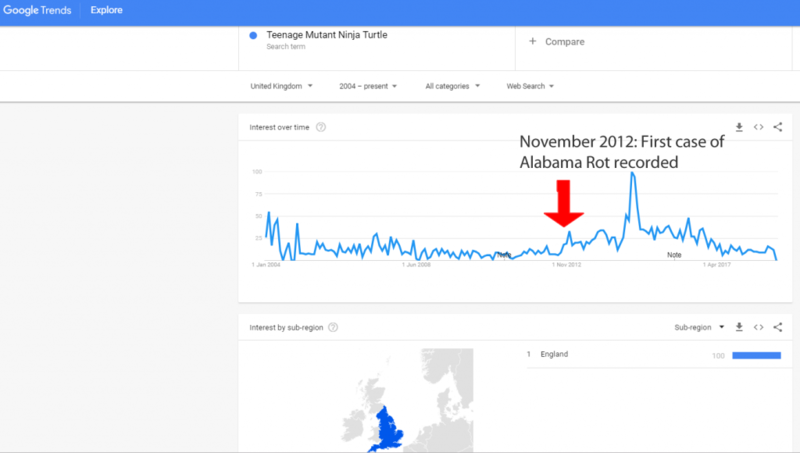 AlabamaRot.co.uk blogged about the funding for this Kim Stevens managed project, in October 2017. 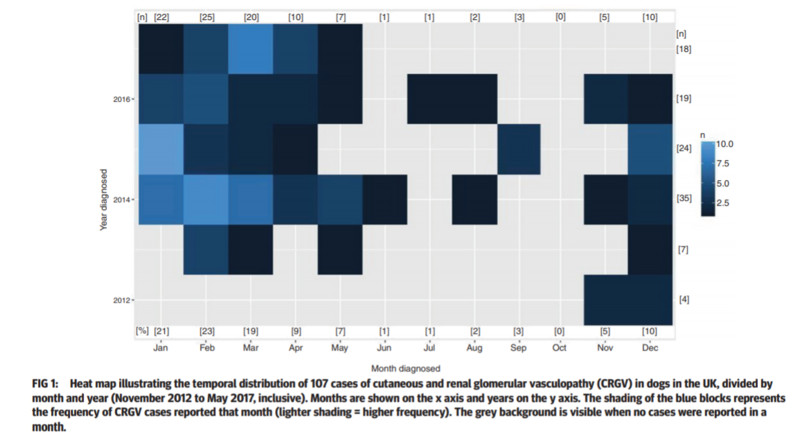 The heat map shows that the much higher prevalence of CRGV in November-May compared to June-October. Of the five most commonly specified breeds in the study population (labrador retriever, Staffordshire bull terrier, Jack Russell terrier, cocker spaniel and German shepherd dog), three were under-represented among CRGV dogs: Staffordshire bull terriers, Jack Russell terriers and German shepherd dogs. Conversely, breeds that were over-represented among CRGV dogs were generally the less common breeds such as English springer spaniels, Whippet, Hungarian Vizsla, Flat-coated retriever and Manchester terrier. See Table 1 in the report. 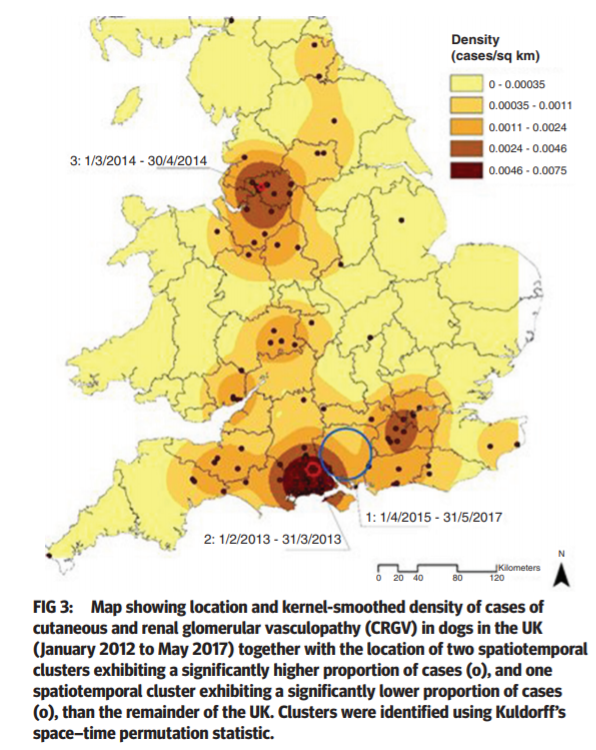 Vet Times October 12th 2018 reports that fish vet Dr Fiona Macdonald has revealed further possible links between cutaneous and renal glomerular vasculopathy (CRGV) affecting dogs, and the UK amphibian disease red-leg syndrome (see 2015 blog post by AlabamaRot.co.uk). Aeromonas hydrophila (A hydrophila) bacteria may be involved in the cause or aetiology of CRGV (Alabama rot). The bacterium is found in watercourses and soil and is associated with diseases of fish and amphibians. A hydrophila causes ulcerative skin lesions in fish, with subsequent kidney failure. In amphibians (frogs, toads and newts} the bacteria causes ‘red-leg syndrome’ -redness of the skin, open sores which can result in death. “Dr Macdonald developed a serology test with Biobest Laboratories to look at the possibility of antibodies to A hydrophila. Samples were obtained from veterinary practices around the country – from Aberdeenshire to the south-west of England – mainly from both suspected and confirmed cases of CRGV, as well as in-contact dogs”, reports Vet Times. She found some dogs showed antibody response to A. hydrophila which has a similar UK geographical spread pattern to CRGV. Dr Macdonald observed: “Although A hydrophila is implicated in a major disease problem in amphibians – red-leg syndrome – this is associated with a Ranavirus*. There is some evidence the Ranavirus may be the primary pathogen, with the A hydrophila as an opportunist”, reports Vet Times. *Ranavirus is a virus that infects amphibians (Wikipedia). Read about co-infection of amphibians with Ranavirus and A hydrophila. Read more in Vet Times October 12th 2018. I assume the private veterinary group is Anderson Moores.